The Plantronics MDA220 USB Switch is specicifically designed to meet the communication needs of companies migrating to Unified Communications, by helping to manage calls from desk phones, softphones and even mobile phones with the same headset. This smart switch gives users the freedom to manage calls from different phones wthout changing headphones, while still maintaining connectivity to the deskphone. Use your landline phone to talk to your PC softphone. By connecting a USB cable (Blackwire type) or a professional headset with a QD/USB cable, you can even receive calls on your mobile phone, as long as it is used with a Plantronics Bluetooth headset with USB key. This flexible switch, which is an easy way to prepare your business for UC, is compatible with PC, Mac, and most Plantronics USB headsets and major phones. 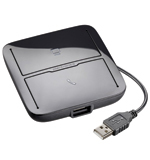 The adaptive design helps ensure future compatibilty with Plantronics desktops, softphones and headsets. 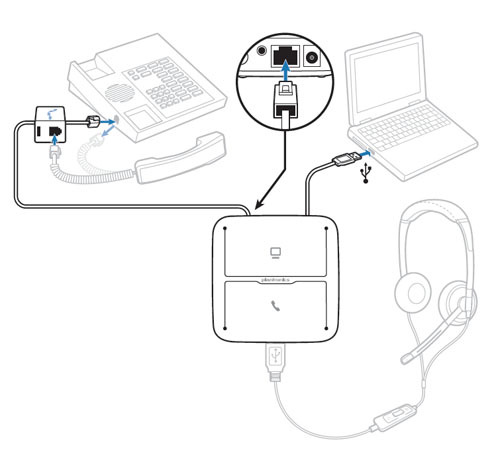 in addition, the Plantronics Manager Pro software subscription service optimizes the management of MDA220 USB switches and connected headsets. The MDA220 USB makes sure that the voice is heard clearly, and that calls are answered quickly. The one-touch remote call control allows you to take charge of your calls on your desk phone and softphone. Compatibility with stereo and broadband audio makes calls sound more natural.